Some of the Perdido students at the exhibit, from left, Emma Hadley, Brianna Peebles, Presley Roberts, Alex Cooper, Carmen Jones, Colton Wiggins, and Jeremiah Powell. 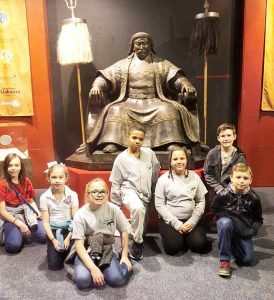 Project Jubilee students at Perdido School wrapped up their unit on China with a visit to the Gulf Coast Exploreum’s Genghis Khan exhibit. Students experienced what life was like in 13th century Mongolia. They saw tents, battle gear, and festival masks from the time period. Live performers from Mongolia played traditional music and danced while wearing traditional festival masks. Genghis Khan amassed the greatest land empire the world has ever seen. Despite the major differences among those he ruled, he was able to unite his people through technology and innovation. His legacy continues today in China, Russia, and the Middle East.